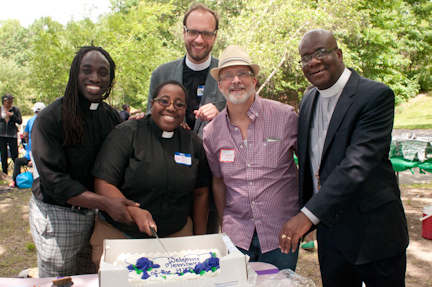 Roxbury-Dorchester Power in Community (RD-PIC) was founded in 2015 by three Episcopal Churches in Roxbury and Dorchester in partnership with the Episcopal Diocese of Massachusetts. It was founded out of the desire to connect the resources of the congregations with the resources of the community in order to increase the ability of the churches and community respond to the needs of the neighborhood. While the collaboration of our churches is a recent development, each of the churches has been involved in community programming in Roxbury and Dorchester for many years. The overarching goal of RD-PIC is to strengthen community in the neighborhoods of Roxbury and Dorchester and to empower members to develop programs and services to meet the needs they determine to be most crucial to the health and well-being of their communities. The initial five-year plan for the RD-PIC focuses on three populations: senior citizens, and immigrants. Each phase involves identifying leadership, skills building, identification of issues most crucial to that population, developing programs to address those issues, implementing those programs and evaluating their effectiveness. In order to accomplish these goals, RD-PIC is developing a community council of leaders from the sponsoring churches and from the communities in which the churches reside. The focus areas of RD-PIC are elders, and immigrant populations. Senior Citizens: A leadership team of elders has been formed in order to lead the effort of harnessing the experience, skills and interests of seniors in the community into an effective voice of senior advocacy. We are building that work through monthly elder lunch gatherings that feature workshops, speakers, and skill development relevant to the interest of the seniors. These gatherings also serve as the space in which the advocacy work takes shape. Immigrant Engagement: We are currently offering ESOL classes at St. Mary’s and citizenship classes at Church of St. Augustine and St. Martin. Trauma & Resilience: Beginning in the fall of 2018 RD/PIC will be offering monthly community forums to provide support for talking through issues and events in the lives of individuals and the community. These meetings are tentatively planned to be held in two different locations in Dorchester and Roxbury. The work of RD-PIC is overseen by an Executive Council made up of clergy and members of the founding congregations and the Executive Director. The work of RD-PIC is carried out by volunteers from the congregations and through leveraging partnerships like the one with the Black Ministerial Alliance. Executive Council: The Rev. Dr. Monrelle Williams, The Rev. Julian Fredie, The Rev. Edwin Johnson, The Rev. Evan Thayer, The Rev. Rospignac Ambrose, Isabella Harris, Leslie Gore, Adrienne Campbell and Cynthia Brewington. Participating Parishes: St. Cyprian’s – Roxbury, St. John St. James – Roxbury, Church of St. Augustine and St. Martin – Lower Roxbury, St. Mary’s – Dorchester, St. Mark’s – Dorchester.